Factchecking Lynn Stuter’s latest, The Traitors in Congress, NewsWithViews.com, Jan. 13, 2009. Ms. Stuter continues her record of continually publishing provably inaccurate information as “true” and “undisputed fact.” Let’s take a look at her latest missive. 1. Barack Hussein Obama has not been vetted or certified eligible to the office of president of the United States by any agency tasked to do so or authorized to do so. FALSE. This statement is belied by the introductory paragraph of Stuter’s own article! As she notes, Congress – without objection – unanimously certified the Electoral College Vote for Obama. In so doing, under Amendment 20, Congress certified that Obama is eligible to serve. Were he not eligible, such objection would have been raised. Moreover, all states followed state law regarding the process for certifying candidates for the ballot. Obama and/or the DNC complied with all documentation requirements proving his eligibility to serve. Thus, at a minimum, this is a disputed allegation. Stuter’s contention that it is undisputed fact is false. 2. Not one American citizen, not one Senator, not one Representative has seen, touched or examined Barack Hussein Obama’s vault copy Hawaii birth certificate. 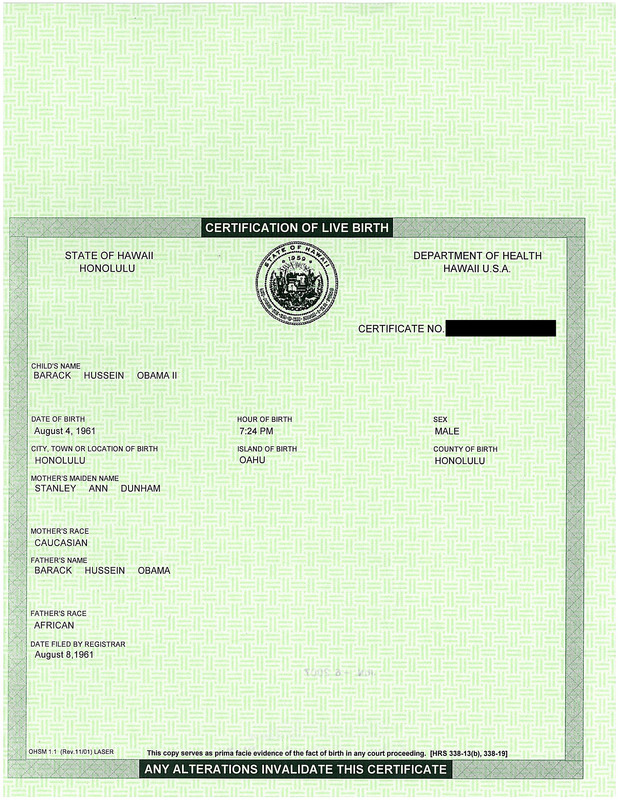 While October 31, 2008, Dr Chiyome Fukino, Department of Health, Hawaii, issued a press release in which she stated that she had “seen and verified” that a Hawaii birth certificate for Obama did exist; she did not state what was on it nor did she state that it showed that Obama was born in Hawaii. 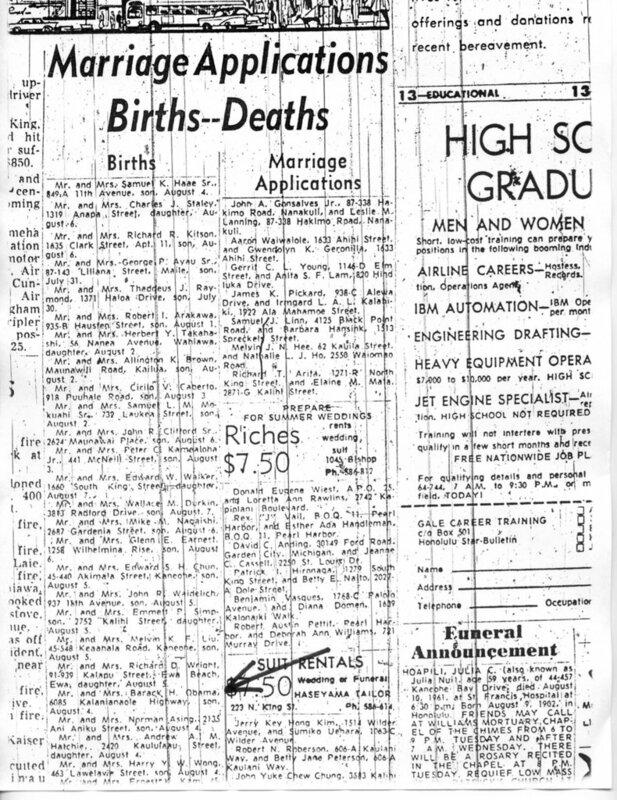 Additionally, at least some Hawaii Health Bureau officials saw Obama’s original birth certificate in 1961, as reflected in the official Health Bureau Statistics records, published in August 1961, shown here and here. Finally, although to be sure, no Senator, Representative, or other person has held a press conference or appeared on radio/TV shows to tout as much. However, this does not mean that none of them have actually seen, touched, or examined the certificate. It merely means that they did not feel the need to hold a press conference to that effect. 3. The Certification of Live Birth (COLB) that Obama has been waving about is not a “birth certificate” as he claims, as the mainstream media claims, as FactCheck.org and FighttheSmears.com claims. The COLB is a short form, computer printed document deriving the information printed thereon from a database of information supposedly (See #13 and #14 below) taken from the original long form vault copy Hawaiian birth certificate. 4. Factcheck.org claims to be a non-partisan organization. Factcheck.org is funded by the Annenberg Foundation on whose board Obama sat. Factcheck.org is about as non-partisan as is Obama. The Annenberg Foundation has never passed up a chance to fund a “progressive” (a.k.a., Marxist) cause. 5. Hawaii has a law, HRS 338-17.8, which allows for the birth registration of a child born in a foreign country so long as one parent is a U.S. citizen and so long as that parent claimed Hawaii as his or her permanent residence for one year prior to the birth. Stanley Ann (Dunham) Obama met both of these requirements. MISLEADING. It is true that Hawaii has the referenced law. However, that law was passed in 1982, long after Obama was born (“[L. 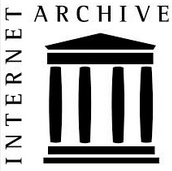 1982.]”). Thus, it is irrelevant whether Obama’s mother “met” any requirements set forth therein – the law simply didn’t exist at the time. 6. If Obama was born in Hawaii, he is, at best, a dual citizen. At his birth, his father was a British subject as Kenya was a British colony. Dual citizenship precludes Obama from eligibility under Article II, Section 1, United States Constitution. Prior cases decided by the United States Supreme Court, involving the determination of “natural born” have used Vattel’s “The Law of Nations” definition which states, “The natives, or natural-born citizens, are those born in the country, of parents who are citizens.” (Part I, Chapter 19, Section 212). Factcheck.org states that Obama was a dual citizen at birth. FALSE/MISLEADING. It is true, based on all credible evidence, that Obama was born in Hawaii. It is also true that at birth, his father was a British subject. However, it is false that dual citizenship precludes Obama from eligibility under Article II of the Constitution. The Court (majority) rejected the “citizenship by parentage” rule (i.e., the view set forth by Vattel), holding that Wong Kim was a citizen at birth (i.e., a natural born citizen; not a naturalized citizen), because he was born in the US, and even though his two parents were Chinese subject. (at p. 705). In other words, in Wong Kim Ark, the U.S. Supreme Court expressly rejected the argument that a person born in the U.S. to non-citizen parents not a natural born citizen — the very same argument Stuter continues to make. Stuter refers to plural “cases.” Given that she fails to identify the cases, it’s difficult to determine what other case she may be referencing. 7. If Obama was born in Kenya, he was, at birth, a British subject as Kenya was a British colony. American law, at that time, required that Stanley Ann (Dunham) Obama be a minimum of 19 years of age at his birth to confer to him her American citizenship if he was born outside the United States; she was only 18 years old when Obama was born. FALSE ASSUMPTION. This IF/THEN statement is based on a false assumption. As discussed above, all credible information (some of which is summarized here) indicates that Obama was born in Hawaii and, under applicable law, that makes him a “natural born citizen” eligible under Article II of the Constitution. See also, #8, below. 8. Barack Hussein Obama’s paternal step-grandmother has stated before witnesses, said witnesses signing affidavits, that she was witness to the birth of Obama in Kenya. See here, here, and here. FALSE/MISLEADING. Stuter refers to an early part of a taped interview, and to affidavits reporting those selected parts (and other information). However, if one listens to the entire so-called “Grandmother Tape,” (particularly 5:50-8:00), it is clear that Obama’s step-grandmother stated that Obama (Jr.) was born in Hawaii. See also here, here, and here for additional information regarding the alleged Kenyan birth. 9. Michelle Obama has stated that Barack Hussein Obama was adopted by his step-father, Lolo Soetoro, an Indonesian citizen. 10. When Barack Hussein Obama was registered at the Fransiskus Assissi Primary School in Jakarta, Indonesia, his father was listed as Lolo Seotoro; his citizenship as Indonesian; his name as Barry Soetoro. TRUE. According to the AP photo of the school registration page, Obama was listed as an Indonesian citizen, and as Barry Soetoro. Note also that according to that same photo, Obama’s birthplace was listed as Hawaii. 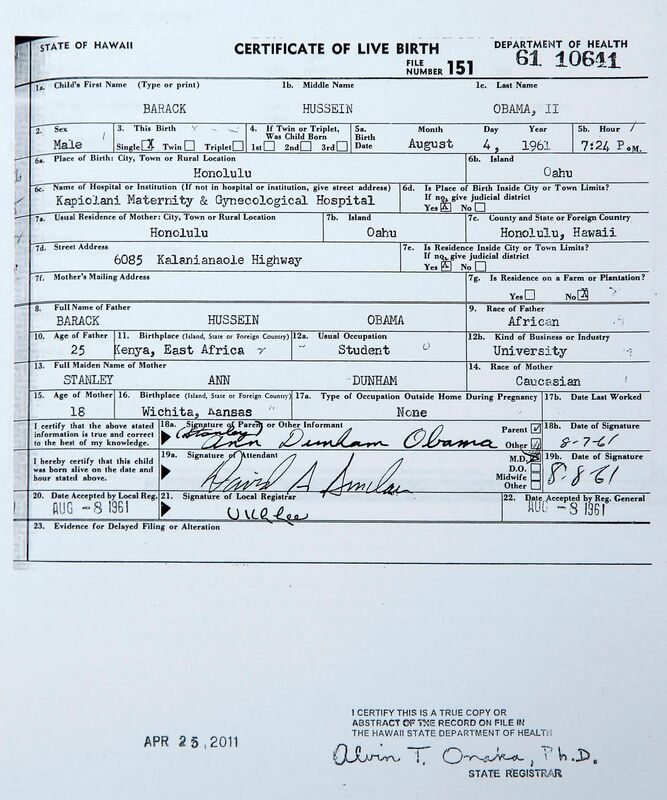 Thus, to the extent Stuter relies on this document as evidence of any alleged Indonesian adoption, its clear statement that Obama was born in Hawaii deserves the same weight. TRUE. 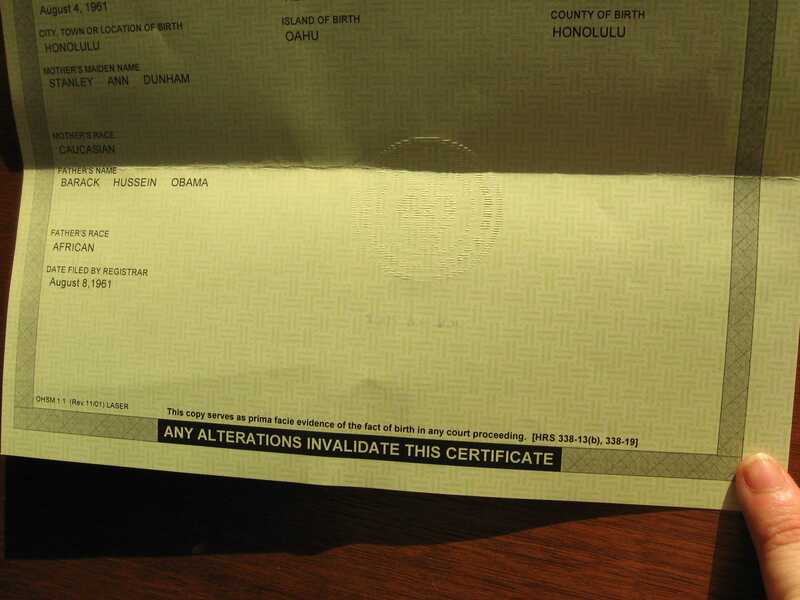 Irrelevant to Obama’s citizenship, but the divorce papers did show on minor child and one child over 18. 12. When Barack Hussein Obama, aka Barry Soetoro, became an Indonesian citizen, his British citizenship would have been terminated; if he was born in Hawaii, also his American dual citizenship. Indonesia does not allow for dual citizenship. FALSE. First, whatever Obama’s parent/step-parent elected to include on his school registration form, Indonesian law in 1962 prevented Obama from becoming an Indonesian citizen, as discussed in this article and, therefore, Obama could not have become an Indonesian citizen even if Soetoro had adopted him. Second, US law in 1962 prevented Obama from losing his US citizenship, regardless of any actions taken by his parent and/or step-parent in Indonesia, as discussed here and here. 13. Returning to the COLB. This document, as waved about by Obama, may be authentic on its face (See #14), but it is not accurate. Were it accurate, it would show Lolo Soetoro as his father; his name as Barry Soetoro. FALSE/UNSUBSTANTIATED. There is no credible evidence that Obama was legally adopted by Soetoro. FALSE ASSUMPTION. The fact that Obama Sr., a Kenyan native, listed his race as “African” in no way calls into question the validity of the COLB. 15. If Barack Hussein Obama, aka Barry Soetoro, did become an American citizen, he became a naturalized American citizen which precludes him from eligibility under Article II, Section 1, United States Constitution. There has been no proof presented that he is even a naturalized American citizen. FALSE ASSUMPTION. As discussed above, all credible information indicates that Obama was born in Hawaii and, under applicable law, that makes him a “natural born citizen” eligible under Article II of the Constitution. 16. Barack Hussein Obama has multiple aliases: Barry Soetoro, Barry Dunham, Barry Obama, Barack Soetoro, Barack Dunham. When he registered with the American Bar Association, he listed none of these as is required by law. Unless he had his name legally changed to Barack Hussein Obama after his adoption, of which there has been no proof presented, Barry Soetoro is his real name and Barack Hussein Obama is an alias. FALSE. This claim has been clearly and unequivocally debunked by, among others, Jeff Schreiber at America’sRight.com here; see also here. 17. All his passport records, education records, medical records, birth records have become “not available” to the public. Those records show where he was born, if he applied for or received aid as a foreign student, the country or countries from which he has received passports. FALSE ASSUMPTION. If such records are not available, it is impossible to determine what they might say. Stuter makes nefarious assumptions based on the fact that, like McCain and other candidates, Obama did not release all prior records to the public during the campaign. 18. His selective service registration appears to be fraudulent. If he was a naturalized American citizen when he turned 18, and he failed to register with the selective service, he is barred from holding any position in government, elected or otherwise. FALSE ASSUMPTION. PajamasMedia has confirmed with US officials that Obama registered for the draft. Thus, the IF/THEN statement is based on a false assumption. 19. If he is not even a naturalized citizen, he is barred from holding any elected office. FALSE ASSUMPTION. This IF/THEN statement is based on a false assumption. As discussed above, all credible information indicates that Obama was born in Hawaii and, under applicable law, that makes him a “natural born citizen” eligible under Article II of the Constitution. A fine post. However, I take issue with how readily you conceded “undisputed fact” number 11. The Soetoro divorce petition does not state that the parties had two children. Rather, Ann Dunham attested that the parties had two DEPENDENTS. A big distinction in the law. A minor child who was born to or adopted by the parties to the marriage is naturally a dependent. But what constitutes a dependent sweeps in a larger group. For example, an elderly parent who lives with or is financially supported by the marriage partners is a dependent, but clearly is not a child. H.R.S. §577-4 Stepparent; when required to support stepchild. Given that Barack Sr. abandoned his wife and child, and that Lolo Soetoro provided support and maintenance for his stepson during the marriage, it is more likely that the reference in the divorce petition is aimed at just the sort of situation envisioned by section 577-4. I would label Lynn Stuter’s allegation as FALSE, or at the very least FALSE/MISLEADING. This article is by a guest contributor. On Guest response #1, Mr Obama’s eligibility by no means hinges on any Congressional objection or lack thereof. Whether he was adequately vetted remains an open question. On Guest response #2, Ms Fukino’s statement merely indicates the adduced CnOLB abstract is consistent with the vault record. Whether both convey misinformation remains an open question. Nor do we know if any Senator or Representative has ever seen, touched or examined either the CnOLB or the vault record. On Guest response #3, it is not clear just what is “disputed” here. On Guest response #10, the Indonesian school registration page may be equally untrustworthy as to both Mr Obama’s birthplace and adoption. Finally, on allegation #18, Mr Obama, were he otherwise eligible, would not be barred from the Presidency whether he failed to register for Selective Service or not. Ms Stuter’s article comprises the usual pack of distortions and misrepresentaions we’ve sadlycome to expect from all sides in this issue. There is no scenario whereby a person could be registered in Hawaii in 1961 and not be born there. 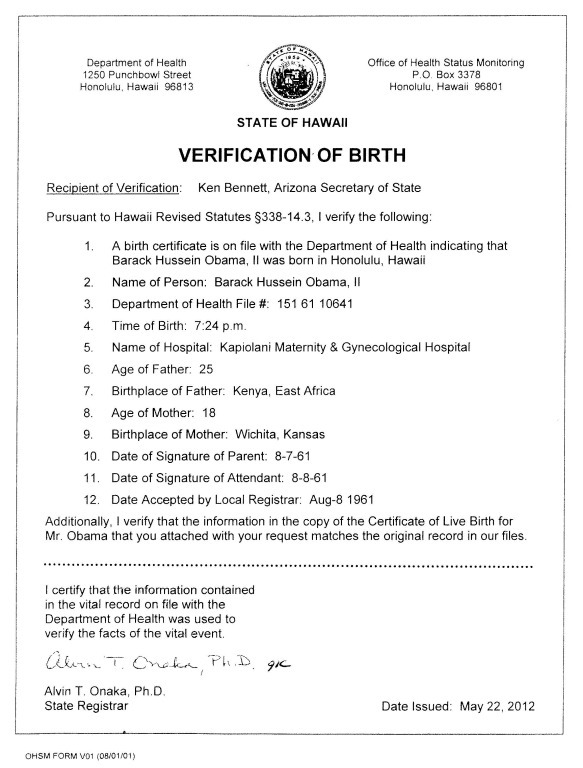 This is argued at length in my article Barack Obama’s Birth Certificate Doesn’t Really Say He Was Born in Hawaii. Would it be fair to say that Dr. Fukino was aware of what people were wanting to know regarding the BC–that Obama was born in Hawaii? A normal person would answer yes to that question. 1. Why she could not release the BC to anyone–because that was the law. 3. If Obama was indeed born in Hawaii and was indeed valid/real/on file with the State of Hawaii Vital Statistics. She could have addressed the first two and never even mentioned the original BC. A normal, rational, sane human being would realize that had Obama’s BC not indeed reflect that Obama was born in Hawaii, Dr. Fukino would have not even mentioned the original BC. She would have made no mention whatsoever about Obama’s original BC. I believe the vault document will indicate a Hawaiian birth like the CnOLB derived from it. The only question for me is the nature and provenanceof that vault document, whether it conveys accurate or inaccurate information and whether it can be supported by authentic birth facility records. That’s all. The rest are red herrings. Got it? Federal law only requires hospitals to retain records for 7 years, Hawaiian law requires hospital to retain records for 25 years. So good luck with that. The hospital where I was born only retains the records from birth to age 21 so my hospital records are no longer obtainable. In that case, the vault record would show that Obama was born in Hawaii too. I talk about this scenario in my article Barack Obama was Genetically Altered Super-Child. Forget about the hospitals. the BC would have been filed with the county clerks office. Document retention guidelines for hospital birth registries (in general) are that the are kept forever. My guess is that a short entry probably exists at the hospital where Obama was born, and this corresponds to the coy response of one Hawaiian hospital spokesperson. A hospital could easily say, with no violation of law, that they had no records on someone. Affirming that they have records is the problem. But why Obama and why now? Orly Taitzwas on WVOX and said one of her plaintiffs in her lawsuit is related to Obama and he put in a request for Obama’s birth certificate. Of course Hawaii said sure, you can have it but it will take one year. 5-7 weeks is the standard for mail requests. Have you been hanging out with Ted? Did it ever stop to occur to you that someone might have notified The State of Hawaii Dept of Health some of the “articles” written by Doc Orly and what she was “up to” in regards to PE Obama’s BC? Thus, their response. It would not be hard for someone to stay a billion steps ahead of Doc Orly. Unfortunately, the answer is pretty obvious. You people are intellectually dishonest. Associate with a mop to Aisle 3. Associate with a mop to Aisle 3. If you have a particular example of intellectual dishonesty you would like to discuss, please feel free. Constructive criticism help make the site better. It’s really sad to me, though. J, Bauer has no idea how many days went into building a site like this, how many web pages were read, books read, trips to the library, uses of interlibrary loan. There’s no question that this web site has an editorial point of view, and that is that Conspiracy Theories about Barack Obama are silly. I express that silliness in my site organization and in my selection of article titles, in satirical articles in the Wild and Wacky section. Nevertheless, the content of this site is serious and what is here is backed up with the best research I know of. Let me be blunt. There are a few web sites, and politically minded lawyers out there that have no problem making up facts out of thin air, and lying outright about others. There are a large number of web sites willing to copy material from those lying sites and there are lots of people who believe them both, and believe them with faith and loyalty. I have looked behind the curtain, I have actually read those supreme court cases and those laws, I have examined pixels in scanned documents, I have talked to attorneys and I have seen the disinformation. That’s why this web site exists. Substantial criticism is welcome and will be carefully considered. A pile of vomit on the door is not going to impress anyone. Exactly, Doc. Which is why a vault record which is not hospital-generated and not properly attested must be corroborated by the original birth facility records. Why? I would not be required to get my hospital records to prove/validate my certified short form BC. And by the way, where do you thinkThe Dept. of Vital Statistics gets their information from? The hospital. That was stated/proven in “What’syourevidence?” that is posted here to read. And according to the hospital where I was born, they no longer have my hospital birth records. They only keep them for 21 years. Haven’t checked about the birth register. Why should President Obama be required to provide more documentation than what I am required to provide to provehis place of birth? I’ve never understood this mentality. Have you actually taken the time to read any of the articles/information provided here? If not, you should. Dr. C. has put alot of time and effort into this website. And the information is accurate/factual with sources provided to check for yourself. I’d advise you (and others on this site) to re-read carefully the recommendedarticles, while keeping your own predilections at bay. Again, bog, you miss the essential point: the Dept of VS does not necessarily get their birthinformation from a hospital or birth facility, where abirth may not have occurred. Most fraudulent birth certificates are probably the result of family deception rather than official corruption.Mr Obama (and Mr McCain)should long ago have put this matter to rest voluntarilyby publicly releasing the vault document and, if necessary, supporting birth facility records. It would have been the wise and politic thing to do. The anti-Obamafringe, if not silenced, would have been marginalized beyond recovery on the eligibility issue. The rest are red herrings. Seriously doubt if these still exist. Mine don’t. “When the birth certificate arrived from the Obama campaign it confirmed his name as the other documents already showed it. Still, we took an extra step: We e-mailed it to the Hawaii Department of Health, which maintains such records, to ask if it was real. I’ll ask my question again, why do you require President Obama to provide additional documentation when all you or I would be required to provide is a certified short form COLB. Huh? You seem to be saying that someone not born in a facility must be corroborated by a facility record. That makes no sense. This says that if Obama’s was born in a facility, then that facility by law had to report the birth. A parent could only report a non-attended birth. In Honolulu in 1981 all births (except for 14) were in a hospital and attended by a physician. Typically when fraud is involved in a birth registration, it is in association with a delayed registration, not a timely one. 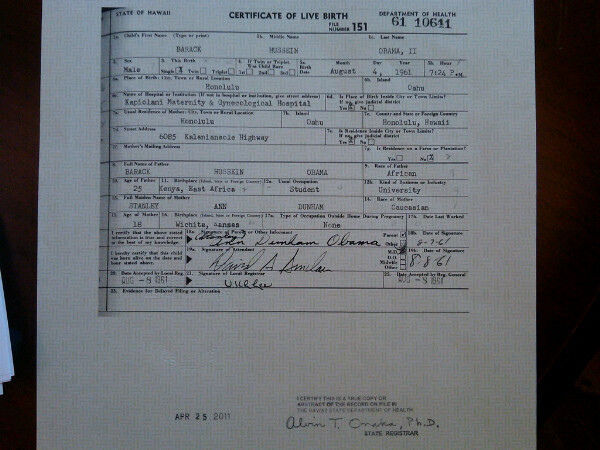 Obama was registered (or so his birth certificate says) 4 days after birth. His prompt registration tied to the rarity of non-hospital births make the fraud scenario highly unlikely. AND SINCE THERE IS NO EVIDENCE BARACK OBAMA WAS NOT BORN IN HAWAII, what’s all the fuss?